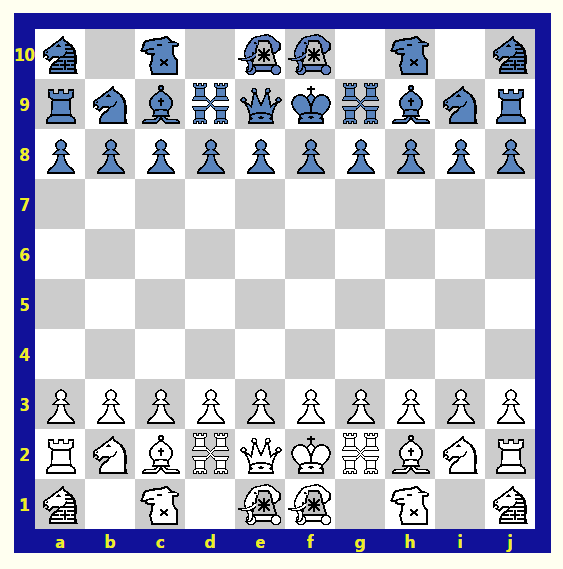 John Davis invented this variation of Mideast Chess. He provided the description and diagrams. It is an effort to modernize and simplify Mideast Chess. The name was chosen to allude to its inspiration in Tamerlane Chess and to signify that it is also a Grand Chess variant. Setup is shown below in this diagram by John Davis. 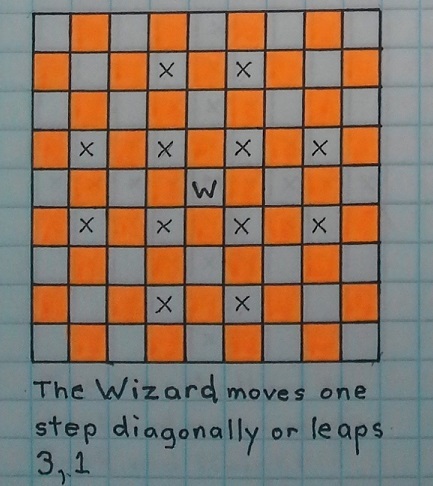 Pieces are the same as Chess with the changes shown in the below diagrams. The Griffon is from Grande Acedrex and is in the Piececlopedia Griffon page. 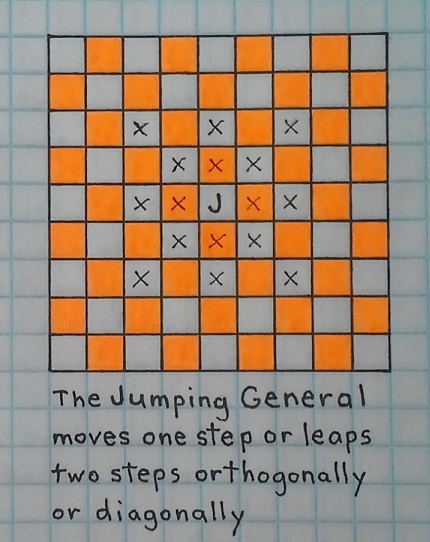 The Jumping General is the name used by Joe Joyce in Grand Shatranj. Its name is the Pasha in Paulovits' Game and the Mastodon in Mastodon Chess. The Wizard is from Omega Chess and is in the Piececlopedia Wizard page. 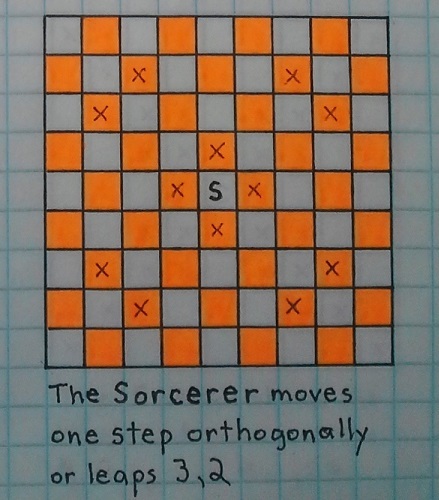 The Sorcerer is from Sorcerer Chess by Charles Daniel. Players should agree on what rules they are using at the beginning of the game. Pawns have an initial two-step move option and are subject to en passant capture. A Pawn may promote on reaching the 8th or 9th rank. A Pawn must promote on reaching the 10th rank. A Pawn can promote only to a friendly piece that has been captured, and for which it is exchanged. If no friendly piece has been captured, then a Pawn may not move beyond the 9th rank. An imobile Pawn on the 9th rank can still give check. Other rules are as in Chess. 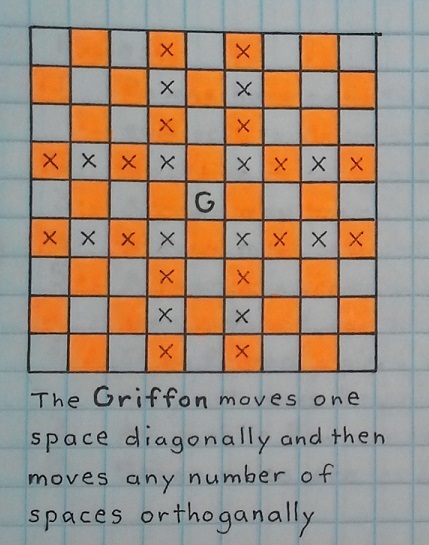 Kings may never face each other across an empty vertical or diagonal line, or cross the center of the board, the "river". When moving to any of the last three ranks, a Pawn may promote to any of that player's captured pieces. A Pawn does not have to promote until it reaches the last rank. A Pawn may not advance to the last rank unless there is a captured piece it may promote to. Even when a Pawn may not advance to the last rank, it may still check spaces on the last rank. John Davis provided the description of Grand Tamerlane and the diagrams. You can play Grand Tamerlane on Game Courier with this preset. Author: Tony Quintanilla. Inventor: John Davis. Thank you for noticing and your comment Nicolino. Mr Muller posted it here at my request. I only have an android phone and have not tried to submit my own rule pages. 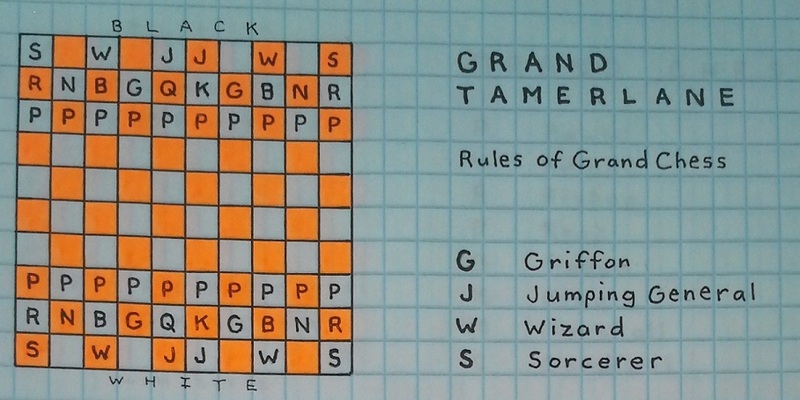 My idea with Grand Tamerlane, Grand Chu Shogi and Grand Courier is to make a basic set for beginners. Grand Chess and Eurasian Chess would round out the set. This is the (corrected) Interactive Diagram for Grand Chu Chess. I guess I hadn't looked carefully at the coordinates of the Stag, as I expected the setup to be Grand-Chess-like, with empty squares on the second rank.